The NFL Draft is imminent. I don’t know about you, but I can certainly feel the excitement across the city, it’s palpable. On Monday, April 27th the 2015 NFL Draft will kick off a weeklong filled festivity from youth football clinics, an interactive area for families, historic Bears memorabilia, and much more. The NFL Draft will go beyond the Auditorium Theatre by hosting an array of events planned for Draft week throughout the city, from hospitals to schools. However, before the mayhem the NFL Draft will undoubtedly create, the NFL Draft will release a series called, “Caught in the Draft,” which returns for a second season, that will look back at five previous drafts: 1965, 1975, 1985, 1995, and 2005. The series will examine five drafts that had a profound impact on the National Football League and helped transform the NFL Draft. The season series kicks off this week and the finale airs on Wednesday, April 29, one night before the start of the 2015 NFL Draft. For all of the latest news and analysis leading up to the draft, visit NFL.com/cfb and follow on Twitter (@NFL_CFB). As for the NFL Draft Town shenanigans, they will occur from April 30th to May 2nd, when the NFL will bring free fan experiences, flag football competitions, musical entertainment, and much more. 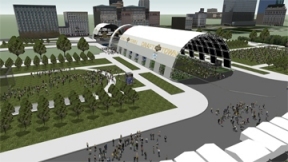 Congress Plaza will host Selection Square, home of the 32 team Draft tables; Grant Park will be transformed into Draft Town presented by Oikos Triple Zero, a free, three-day outdoor interactive fan football festival spanning the size of 15 football fields. No tickets are required for Draft Town presented by Oikos Triple Zero. A limited number of tickets are available for both the Auditorium Theatre and Selection Square. Sweetness Simulator – This wind tunnel skydive simulator floats fans into the air where they can strike an iconic football pose in the heart of the windy city. Run Like the Wind – Fans will have the opportunity to test their speed by running alongside a 40-yard long LED screen featuring NFL stars running the 40-yard dash. Super Bowl Museum (Pro Football Hall of Fame display area) – This exhibit features historical Bears memorabilia, the Vince Lombardi Trophy, Super Bowl rings and the AFC and NFC Conference Championship trophies. 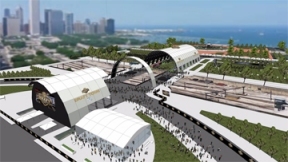 For more information and/or for a complete list of activities, visit NFL.com/DraftTown.